For the past several years of my teaching career, I have enjoyed working with my students in a cooking unit. I love to cook and bake at home with my own kids. I've shared many of my adventures on my other blog. becca-homeiswheremystorybegins.blogspot.com I believe all children should grow up feeling confident in the kitchen and be given the opportunity to learn about food preparation. While we don't have a full kitchen in our classroom, there are many activities we are able to do. We make applesauce in the crockpot, do simple food assembly projects, and recently have purchased a convection oven for the school. The convection oven is on a rolling cart and we are able to share it between classrooms. Of course, in addition to having fun, building our schema for baking and cooking, and sampling tasty treats, we have our standards in writing to think about. In this page of the Kindergarten Kids blog, I'll address the EALR's, share some photos of our charts, projects, and student work, and I will share a few ideas to get started cooking with kids in the classroom or at home. How does the cooking unit address EALR’s? • We use pictures and talk for thinking about and planning writing. We create an experience for kids to write about. The experience is our prewrite. The kids have walked themselves through the process, step by step. We have followed a sequence of events, talked through new vocabulary, discussed action words, and retold our steps. This has all happened before any actual writing takes place. We know that young children need to use drama, visuals, and concrete objects and actions to plan writing. The actual cooking creates that kinesthetic activity. • We produce a draft with words, captions, and/or sentences. Some kids may simply draw the steps we took in our food preparation and label each step. Using our cook books or food prep posters as our mentor text, they will see that this is acceptable. Kids who are ready for the next level, may write a phrase next to their illustration, or continue on and write a full sentence describing a specific step. • We understand that there are conventions of punctuation and capitalization in writing. All year, we have been working up to writing complete sentences. We started the year, using Richard Scarry’s books as mentor texts. We noticed how he labeled his pictures and we worked to do the same thing in our stories. We moved on to phrases and sentences from there. Happily, most of the students in my class are able to write complete sentences, using invented spelling, sight words, appropriate spacing, and sometimes capitals in the correct places. (Some of my students still write in all caps.) I am fortunate enough to have an educational assistant in my room, who pulls a writing group each day. Conventions in writing is the main area she works on with our students. Now that we are moving into recipe writing, kids are noticing the difference between labels, phrases, captions, and full sentences. We can talk about where authors choose to use these, and what the author’s purpose is. • We publish our own writing. From the very start of the school year, we published our writing. Whether we were making books, writing letters, or just writing on one page to share with the class, there has been a purpose for writing and that purpose is to share it. Most days, at the end of writing time, we have a sharing circle. Each student chooses one piece of work they feel good about, and they bring it to sharing circle. We meet on the carpet and kids get ready to share. The most exciting part about sharing circle, for kids, is using the microphone. I don’t require kids to share their writing and we certainly don’t take the time for each and every person in the class to share every day. I do ask that each child bring a piece of work they feel proud of to our sharing circle, even if they know they don’t want to speak in front of the group. Giving kids the opportunity to be reflective about their best work is just as important as the writing itself. As kids are sharing, we celebrate the writer as well as the writing. We congratulate kids on a job well done. We listen as they share and applaud for them when they are finished. Sometimes our sharing circle is just a celebration of all that is good in Writer’s Workshop. Other times I point out really smart thinking by kindergarteners. If I have just had a conference with a student who used a writing strategy that we’ve been practicing, I might point this out to the class. Sharing circle is our celebration. It brings us closer as a community of writers. • We write for a variety of audiences and purposes. Our cooking unit provides a wonderful sense of audience and purpose. We when get finished making something in class, kids always say, “Can you tell my mom how to make this?” Writing our recipes, to take home, provides a genuine audience and purpose, which kids are extremely excited about. Audience and purpose is also addressed in a homework projects. I ask kids to make something at home, with mom or dad, which they really love and want to tell us about. Sometimes it is a cultural dish and sometimes it’s boxed brownies. We never know what we are going to get. The kids know these will be displayed in the hallway, for everyone to see. There is such pride in these pieces they have created with their families! • We write in a variety of forms and genres. By late winter, when we begin our cooking unit, we have written class books, individual books, experiential stories, labeled pieces, letters, cards, and notes. We are ready for something new. Writing instructions and procedures is something most kindergartners have not tried yet. We have spent lots of time writing on lines, by late winter. When I introduce our Cereal Notebooks, made from cereal boxes and unlined paper, kids get really excited and sometimes a little apprehensive. The security of writing on the lines has been taken away. I think about it like a child who has been coloring within the lines in their coloring book and suddenly they are given blank paper to color on. Sometimes they don’t know where to start. Fortunately, because of the work we have done in illustration study earlier in the year, the kids in my class are ready to make decisions as authors and illustrators. While some children write their procedures in a simple, 1,2,3, step-by-step progressions, others will divide up their page with boxes and make each box into an individual step. The other day, I asked one of the girls in my class why she chose to divide her page up. She couldn’t come up with the name of the author we learned about who used this technique, but she knew that it helped her to see each step. One of the children who was listening in, jumped in and said, “She’s talking about Gail Gibbons. Remember how she showed us how to plant apple trees and pumpkins.” After sharing this in our Sharing Circle, now we just refer to this method as the Gail Gibbons way of showing steps. It was one of those teachable moments, where the kindergartners were actually the teachers. • We use appropriate style in our writing and illustrating. Much of our style of writing in kindergarten comes through our illustrations. I’ve always known the importance of illustrations. In kindergarten, especially, illustrations serve as a vital piece of prewriting. It wasn’t until I read Katie Wood Ray’s book, In Pictures and In Words, that I was really able to thoughtfully plan and develop a true illustration study. 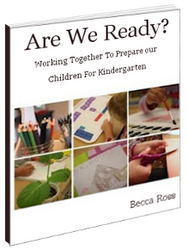 • We know and apply writing conventions appropriate for kindergarten. As I shared earlier, much of the early part of the school year was spent learning basic conventions. The conventions of spelling, capitalization, and punctuation are continuing to be addressed throughout our cooking unit, but they tend to be more difficult to see in published pieces. Our young authors are making decisions about the way they would like to see their recipes look on the page. They are making decisions about text, full sentences, labels, numbering steps, and many other aesthetic s. For many, this is their first experience reading and writing this type of writing. I have found that this is a lot to think about for kindergarten. Many kids forget to use proper spacing and capitalization during this unit. They continue to use high-frequency words appropriately, utilizing our word wall. They sound out unknown words, using beginning, medial, and ending sounds. We have a cooking chart, with pictures of cooking related pictures and words. Kids can take these cards back to their seats during writing time. Even though conventions may not perfect during this unit, we still remind kids of our expectations and have discussions about our choices. The finished product may not look as neat and organized as a piece written on our standard lined paper, but the trade off for the kids’ ability to make decisions as authors and illustrators is worth it. • We set goals for improvement. Conferring is one of my favorite times of a writer’s workshop. At the same time, writing conferences present the biggest challenge for me. The goal of the writing conference is to provide each child with the mini-lesson or support they need on that particular day. My purpose is to listen to each child, reflect on the work they have already done, and help them learn a skill that is relevant to their writing at that moment. I’m not trying to make their writing perfect. I’m trying to help the writer move toward becoming a more confident writer. I’m trying to infuse the skills, language, and application they need into a very short conversation about their writing. The steps I use in a writing conference include, inviting the child to share their work, naming and pointing out the things they are doing well, and helping the child set a goal for their next step. I have a fairly large collection of children's cookbooks. Some are my own and some are from our school or public library. When we kick off our cooking unit, we start with a book frenzy. We sit in our circle, each starting with a book in hand. Then we browse through the book for about 30 seconds, and pass it on to the next person. 30 seconds doesn't give kids a lot of time to look through, but enough time to see that they are interested in trying a few fun recipes. They always get excited about the bright colors in the pictures and the kid friendly foods. At the beginning of the unit I send home a 12x12 sheet of paper with each child. I ask parents to help their child cook, bake, or prepare something in the kitchen. They are welcome to use pictures, stickers, fun papers, or anything they'd like to decorate their project. My goal is to have parents and kids working together in the kitchen. Many of my students don't help parents in the kitchen, so this is a new and exciting experience. We display these in the hallway and everyone loves to see them as they walk by. The kids loved making fruit salad. It was easy and a healthy treat. I asked parents to donate fruit, instead of sending snack for the day. Baked zucchini was really fun to make with the kids. I pulled out the zucchini that we would be using and all of the kids said, "Ewww! I'm not eating that!" I told them that my own kids love this, because it kind of tastes like french fries. Of course, when I asked them if they like french fries, they all said yes. I sliced the zucchini, and we tossed the slices in a ziploc bag. The kids helped drizzle a little olive oil and made sure the zucchini slices were coated. Then we added a half cup of seasoned bread crumbs, a half cup of Parmesan cheese, and a little salt. We shook the bag up and laid the slices on a cookie sheet. We baked these at 350 degrees for about 15-20 minutes. They smelled wonderful as they were cooking. I'm happy to report that EVERY child in the class tried them. Only two kids said they didn't care for them! I have these great cooking cards, from Wright Group, which show step by step instructions for making your own snack. We used the pizza instruction card to show us the steps. Then we drew and wrote our own recipe in our books. Always a favorite activity, we make chocolate chip cookies. Most of the kids can't write all of the directions, but we talk about how children's cookbooks use simple pictures and simple labels to show ingredients or steps. This year, each child made their own book about making chocolate chip cookies. We made simple four page books. Kids decided, on their own, how they wanted their book to look, and if their book would be a story about making cookies or directions and ingredients. I believe kids should be able to make choices, as authors would, about the purpose of their books. 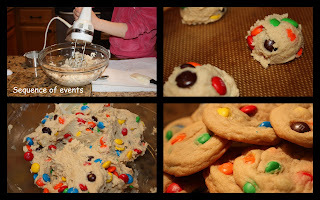 TIP- Make an extra batch of chocolate chip cookies at home, the day before doing this in the classroom. The teachers in nearby classrooms will thank you. The warm cookie smell is hard to take, if you know you won't get to eat them. By baking at home, you'll have plenty to share. Some kids enjoy writing recipes from memory. It's pretty cute to hear how they think something is made. After making fruit salad, a few kids wanted to create their own recipes for fruit salad, using their favorite fruits. I love the way the kids took ownership of this activity. It was not required that all kids do this, some kids just wanted to spend time finishing another recipe or writing another favorite recipe from home. I purchased some great fruit and vegetable flash cards from the Fruits and Veggies Matter More website. Each day we focused on a different color of food. The flash cards have clues and kids guess the different fruits and veggies. Each day when we were talking about our color of the day, we also had a tasting table. For example, on purple day, we gathered as many different purple fruits or veggies that we could find. Kids loved trying new things. Mrs. Walters, my kids' kindergarten teacher, always tells her kids that their taste buds change. Things they once didn't like, they make like next time they try it. I think my students were surprised at how many things they thought were yummy. We tried to focus a lot of our work on healthy choices. 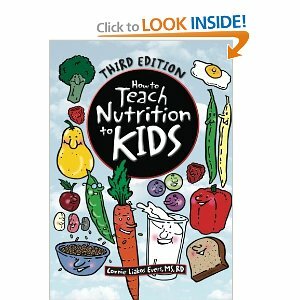 I bought a book from Amazon about teaching nutrition to young children. We make our writing notebooks out of cereal boxes. They are colorful, food related, and FREE! The kids love that they are new and different. We make simple four page books out of donated scrapbook paper and white copy paper. I usually put a smiley face stamp in the upper left corner. This helps with directionality of the books. Kids know if the book is smiling at them, it is facing the right direction. I hope you enjoy some of these ideas with your kids! This cooking unit is a work in progress. I'm always changing, revising, and adding new materials and recipes to try. I'd love your comments, suggestions, feedback, or shared experiences!